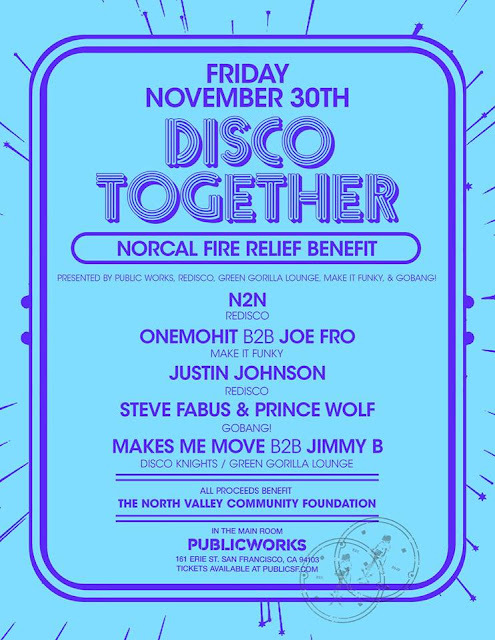 Join the Public Works family, Redisco, Green Gorilla Lounge, Make it Funky, Go Bang! and the Bay Area dance community for a very special "Disco Together" fundraiser benefiting Northern California fire victims on Friday, 11/30. The intention of the event is to bring together members from various communities in an effort promote more unity, connection, collaboration and collective support. All proceeds from this event will go to the North Valley Community Foundation (https://www.nvcf.org/). Special thanks to our sponsors: Stoli Vodka, Firestone Walker Brewing Co., Lagunitas Brewing Co, Deschutes Brewery, New Amsterdam Vodka, & La Marca Prosecco!